A couple of days after the news that Google is to acquire the smart thermostat and fire alarm company Nest, my main thought now is that I’m jolly glad I don’t work for a utility company right now. The poor things, just about catching up with the web. Making tentative steps into the world of connected devices, apps and the Internet of Things. You can’t move at Waterloo Station at the moment without seeing banners for British Gas’s heating by mobile phone service* Hive. And then Google come along, buy up a stylish, ex-Appler-founded groovy startup and the world goes “pop!”. In this day an age, owning a physical distribution network that only allows limited types of stuff to travel over it is a liability. They are expensive to build (which keeps down competition) and so tend to be regulated. They are expensive to maintain (involving fleets of Transit vans and helicopters and hairy-arsed engineers who don’t suffer vertigo and that kind of thing). And in many cases the stuff that comes out of them (electricity, gas, water, data) is next to impossible to differentiate by anything other than price. Which means everything becomes a margins game, but in a world where (because of all of the above) you have the fleet of foot of a diplodocus. For the smart home to happen, it’s all about things talking to each other – not just about us talking to things though an app where once there was a button or a dial. It’s, I guess, a little like the difference between email and a social network. That means taking an approach that is independent of application – and I just don’t see that the utilities will be able to get their heads around that at all. Hive, for example, connects your mobile phone to your heating control system. Neat, for sure. But of limited long term benefit. Google coming onto the scene changes the game (and Nest is one of a number of acquisitions and activities that they are undertaking). The really disruptive part is that Google’s whole business is founded on gathering, connecting, and transacting upon data about things that happen. 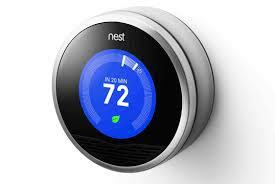 Nest becomes another data and transaction node. Google Now on Android devices, in a fairly clunky way, provides information and transactions before you ask for them (the route home, the weather, places to see nearby and so on) based on what you’ve done and where you are. Your calendar and your location and your past behaviour makes knowing when to turn your heating, or your lighting, or your bathwater, on or off a background task. Utility companies will never have that level of information to provide such integration. In the midst of all of that, the utilities will think that bolting a bit of shiny tech onto the front end of their service will be all that their customers want or need. If you look at the interfaces for most utilities to their customers today (heating thermostats, water stand pipes and mains stopcocks, electricity and gas meters, the mess of cables that locates around the main phone or cable socket, obfuscated billing, “Press 1 to enter Hades” call centres…) you’ll know that “user experience” is not a term that these guys really get.